Renault has picked the Geneva Motor Show to premiere the production ready version of its Zoe electric car, which will be priced from £13,650 (after the plug-in grant deduction) when it goes on sale in Autumn. Buyers will also have to pay a monthly battery lease of £70. The Zoe follows on from the introduction of the Fluence ZE and Twizy, both of which are also electric. Unlike the Fluence ZE, the Zoe was designed from the ground up as an electric vehicle. Its electric motor produces 87bhp and 219Nm of torque, with a maximum range of 130 miles between charges. Most people won’t manage quite such a distance before needing to plug in, though, and charging from from empty to full can take very little time thanks to new charging technology. 60 patents have been filed during the development of the ZOE, with innovations to improve range and comfort. The range of the car is dependant on usage, but it an urban environment it's expected to cover 60-90 miles between charges. Energy saving technology includes regenerative braking and a heater system that has no effect on the vehicles range. Michelin Energy Saver EV tyres designed specifically for electric vehicles reduce rolling resistance and withstand the immediate torque delivery unique to electric motors. A new charger, called Chameleon, reduces battery damage and can, dependant on the power output it's connected to, charge the car in just an hour. Other neat technology fitted to the ZOE includes a 'voice' system that allows the otherwise silent car to be heard by pedestrians and 'R-Link', which allows users to access data and operate certain functions remotely from theire phone. As an example, charging can be turned on and off remotely. 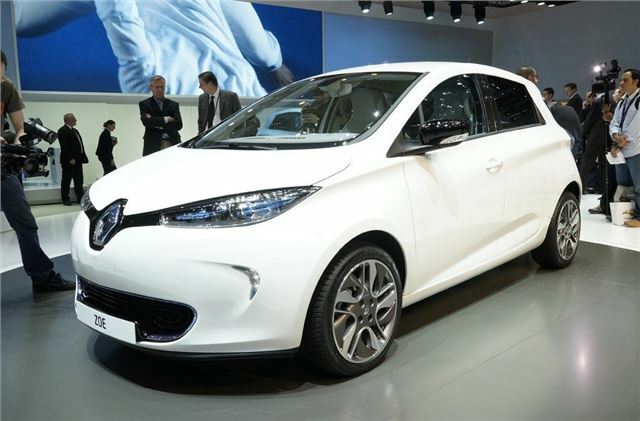 Renault aims to cut its carbon footprint by 10% by 2013, with a goal of a further 10% reduction between 2013 and 2016.